Steve Minty is such a huge fan of Disney's Up! 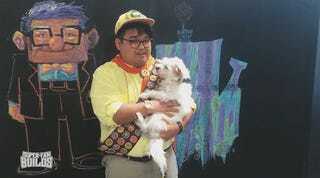 that he adopted a dog, named her Doug and fashioned an MP3-powered voice box so the pair could cosplay together. If these two don't deserve a custom Up! dog house, I don't know who does. This spectacular dog house is the latest creation from the folks at Super-Fan Builds, makers of the baby Batmobile and fine Final Fantasy cutlery. The amount of work put into the house is staggering—each individual roof tile was affixed, a steel frame was built to give it the floating effect and a massive cast was built to create the hollow fiberglass balloon assembly. I'm really loving this stupid Youtube show. The idea that I could love something so much a group of master builders makes me a thing is incredibly appealing. Now all I have to do is become ridiculously obsessive about something.